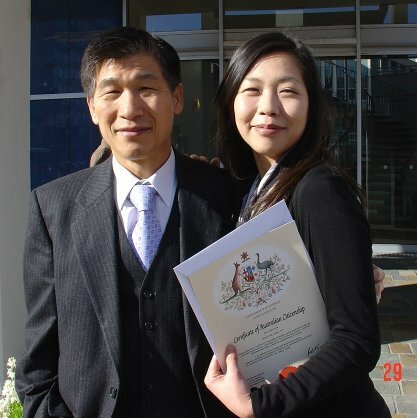 On Friday, James’ elder daughter, Nicole Ho Jung, became an Australian citizen. I joined them at the citizenship ceremony – the first time I had been to one. It was welcoming, simple, but solemn. The Speaker of the A.C.T. Legislative Assembly, Wayne Berry MLA, gave a short speech of welcome. The candidates then became citizens by making the pledge of allegiance. From this time forward, under God, I pledge my loyalty to Australia and its people, whose democratic beliefs I share, whose rights and liberties I respect, and whose laws I will uphold and obey. Mr Berry presented each new citizen with a Certificate of Citizenship and we sang “Advance Australia Fair” together. Above are James and Ho Jung, a little sad at another tie with Korea being broken, but happy to be Australians together.